← The physical challenges of cancer and treatments. Does there need to be a paradigm shift in how exercise is used in oncology (if it’s being used at all)? I was reviewing my blood work after my recent stem cell transplant and noticed that my hemoglobin and red blood cells had dropped 47% from my normal health to their lowest values two weeks after my transplant. I then checked what altitude a 50% drop in oxygen would correspond to. A 50% drop in oxygen represents an altitude of over 19,000 feet. Mt. Everest south base camp is 17,598 feet. I spoke with a couple of altitude and exercise experts to confirm my comparison. They suggested that in many ways a chemotherapy related drop in hemoglobin (carries oxygen) would be more difficult than the physical challenge of a drop in the partial pressure of oxygen due to ascending to high altitude. No wonder many cancer patients have a difficult time with some chemotherapies, even more so sedentary patients. Furthermore, if one is to factor in cachexia (the muscle wasting common among symptomatic cancer patients), decreased activity due to cancer related fatigue and hospital bed rest, then by the time some patients’ hemoglobin drops below 8.0 (the level at which they might need a transfusion) their cardiovascular fitness has already been significantly impacted. Lower this capacity further with some chemotherapies and you have some patients in their fitness training zone (if not maxed out) just walking across a room. Additionally, some drugs used during cancer treatments, like corticosteroids, can cause muscle weakness, further impacting physical function. All of these things can significantly contribute to the downward spiral of ongoing cancer treatment related fatigue. It would be irresponsible to send someone to Mt. Everest base camp without training them first, but it is common practice in oncology to physically challenge patients in a similar manner without training them for the difficulty to come. Instead, we nurse patients through the treatment challenge, cheer when they are finished, then send them off to physical therapy to address the injuries. This is not a success story, this is poor survivorship care planning. 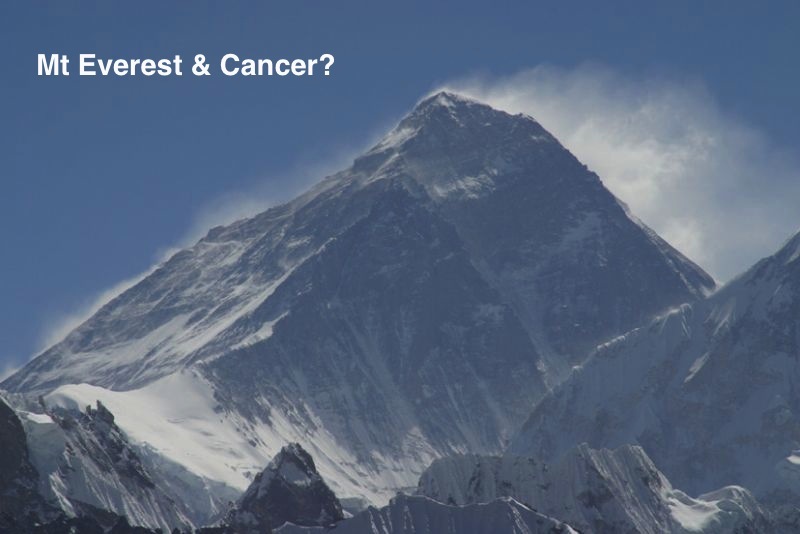 The emphasis on post-treatment survivorship care plans in oncology is like having someone train for Mt. Everest after they return from climbing it – clearly, some of the training must occur before the ordeal. Cardiology figured out decades ago to get patients moving as soon as possible in order to improve survival. Currently, in oncology we provide recliners for patients during chemotherapy. Does this need to change? After all, they do let us walk out of the chemo infusion wards. There often is time between cancer diagnosis and first treatment to implement a survivorship care plan that includes exercise. One might even go farther back, possibly to the first encounter with a primary care physician because of symptoms, or perhaps to the first biopsy. Additionally, patients frequently seek second opinions, get an additional whole node biopsy, consult with another specialist, and weigh treatment options before finally having their first cancer treatment scheduled. All of this can take weeks. Is this enough time for an exercise intervention to significantly affect treatment outcomes – including response rates, or at least to maintain fitness and avoid detaining? If the focus in oncology remains on post-treatment rehabilitation we may never know, and patients will continue to struggle more than they may have to through treatments that may be more demanding than we currently realize. If patients are willing to have their bodies ravaged by surgery, radiation, and chemotherapy, all of which can decrease physical function, then it shouldn’t be too much to do 30 minutes of walking a day, however one wants to carve that time up, as a part of cancer treatment plans or at least as a part of survivorship care planning. With better planning prior to first treatment maybe exercise can improve cancer treatments and reduce treatment side effects, including cancer related fatigue, which appears to be more debilitating than we thought. First, we need more pre-habilitation research. NOTE: 12/16/14. The abstract below from ASH 2014, San Francisco, provides evidence supporting the importance of fitness going into stem cell transplant. This is an important and neglected topic for anyone considering chemotherapy or a transplant. Thanks for sharing your story and personal lessons learned. Thanks for this wonderful article! All so true and important. Our body needs to be in the best condition it can for the best results. Food choices, Supplementation, Exercise all play a role in support. Thanks for this. There are a few of us that have kept our blood cancers under control with diet and exercise. In my personal experience the exercise must be regular and significant, but then I see the results. Keep it up and best of continued good health to you! Reblogged this on The Other Side of the Stethoscope. Excellent post, we do so many things backward in medicine regards to public health and oncology is no different.